If you see figures regarding solar activity, you could conclude that we are very close to the start of a new solar cycle. That means within a few years my beloved 10 m band will open up again for DX. But I have also been struggling for four years with extreme QRM levels on the higher HF bands. On 10 m even up to S9. Main cause is the solar panel installation on my next door neighbour’s rooftop. (more about that in this previous blog post). I wanted to tackle this QRM without my neighbour having to shut down his solar panels. By coincidence I ran into a video shared by Marco, an old radio friend in Switzerland. He demonstrated a QRM Eliminator. I always thought that these devices were not very effective, but I was impressed by how he just turned the QRM away. OK, I had to have one of these, because it could be the key to DX’ing on 10 m again. Good to know is my radio setup. I use a Kenwood TS-480HX. Antennas are a 13 m tall vertical with a CG-3000 remote autotuner for 160 m to 10 m and a horizontal dipole for 6 m band. Radio is hooked up to a laptop for digimode and remote control over the internet. First of all the basic principal of this device. 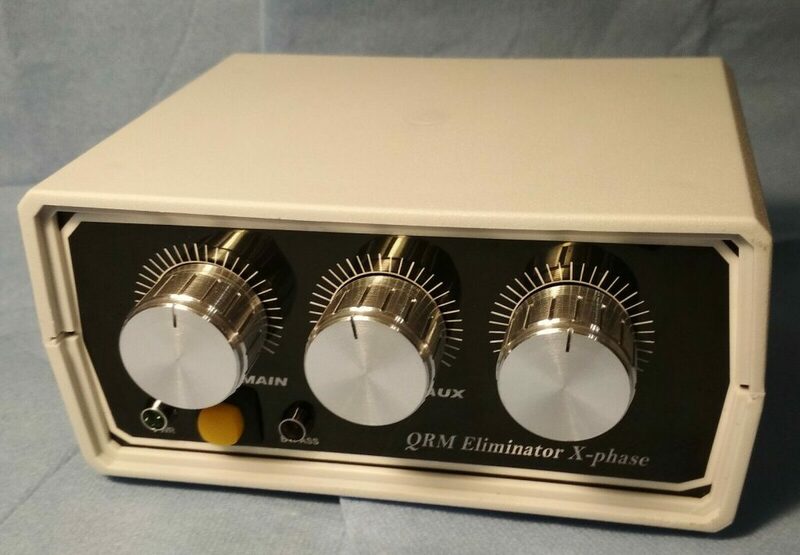 A QRM eliminator is also known as an X-phase device. It works on the principal of phase shifting. When you take two separate but identical signals, you can mix them together. If the signal, take a sinus wave in mind, has a positive peak value of +10 and the identical signal is added to it, your output is +20. So, what comes out is a signal that is amplified. But now we delay one signal and again take a sinus wave in mind. We delay iy so much that the negative part of one wave comes out at the same time as the positive part of the wave. The positive peak of the wave is +10 and the negative -10., so if you take +10 and add -10, the result is 0. You actually cancelled the signal and nothing comes out. The QRM eliminator needs two antennas. You could use equal antennas, but that is not a necessity. The QRM eliminator has a built in preamplifier and attennuator which allows you to make both signals equally strong. You need to put it between your radio and main antenna and then add a, what I call, reference antenna. The device has a relay which bypasses the eliminator and switches to the main antenna . To operate this relay you need a PTT cable from your radio to the QRM eliminator, also known as an amplifier control cable. There a two commercially available QRM eliminators, MFJ Enterprises offers the MFJ-1025/1026 and WiMo offers the QRM Eliminator. There are small differences between those two. WiMo’s device covers 3.5 to 54 MHz. The MFJ covers 1.8 to 30 MHz. WiMo also claims it’s version can handle 200 Watt input. That’s attractive when you use a 200 Watt Kenwood TS-480HX like I do. The difference between the MFJ-1025 and MFJ-2016 is that the 1026 has a built in telescopic reference antenna. At time of writing the WiMo costs € 159.00, excluding shipping. The MFJ-125 costs € 225.00 euro excluding shipping at the Dutch distributor. If you are a handy guy, you could consider building one yourself. There are several kits available through eBay and other (commercial) providers. Some radio clubs also offer it as homebrew projects. Prices for kits average between € 50.00 and € 100.00. PTT cables are also commercially available, around € 25.00 average, but you can also make one yourself. Check the manual of your radio for the pin settings. If you do a search on eBay you might also run into versions built and offered by other hams. This is where it got interesting for me. Kits are always difficult for me as I have a badly functioning right hand. I cannot hold a soldering iron too long. Even soldering a UHF plug is quite a challenge. So, I wanted to buy a ready made device. I ran into two amateurs who both offer a QRM eliminator. The version that US4LG Igor build is my favourite. It covers 1.8 to 30 MHz. Its casing is very sturdy, has big knobs making it easy to operate. The finishing is of commercial high quality. Even more interesting is that it also has a VOX based bypass switch. When it senses RF signal on the input, it activates the bypass relay. It means you have a reliable backup system for whenever you forget to hook up your PTT cable or you’re the PTT control on our radio is switched off by accident. If you decide to put in 100 Watt without bypassing , you WILL damage the device. The US4LG version can handle 100 watts input. I believe that is in digimode. I am not sure if it will handle more power in SSB. The price: I bought it for € 69.90 (dollar-euro exchange rate at the time of ordering) including shipment. My luck that the package passed customs without having to pay import taxes and VAT. Otherwise I would have payed about € 100.00 in total, which is still less than the WiMo and MFJ versions. The PTT cable has an RCA plug (cinch) on one end and stripped and soldered wires on the other end. You only need to solder a plug that fit’s the amplifier control port of your radio. Or buy a readymade PTT cable (also available through eBay or local radio shops). You will also need a short cable to hook up your radio to the TX inout of the QRM Eliminator. It has SO-239 connectors for both antennas in TX input. My TS-480HX needs an 8 pin mini DIN make connector to hook up a PTT cable. I thought I had one, but it turned out to be a 9 pin version. Believe me, no mods available to have if fit to an 8 pin female output. I had to rely on the VOX switch for its maiden test and in the meantime ordered an 8 pin version on eBay. What else did I need? O yes, a reference antenna. That’s easy to make with a few meters of electrical wire running through the shack. Powered it on and nothing happened to the signal, still much QRM, great! Next step is to try to phase out the QRM by turning the phase knob. Something happened there, the QRM decreased. Next step was to equal the signal strength from the main antenna to that from the reference antenna. I had to turn up the signal from reference antenna completely and entirely turn down the main antenna. But clearly the QRM was about three S-points less. I concluded that the signal picked up by the reference antenna was too weak, so work to do. Next question, will the VOX work? Without a PTT cable I had to rely on the built in VOX. I turned the power of the radio down to 5 Watts. Pushed the mike’s PTT button, and…. the bypass light turned on while I could hear the relay switching to the bypass. Phew… I tested the VOX furthermore with 100 Watts, but also with 1 Watt which was enough to activate the bypass, so that’s a reliable VOX. Earlier I mentioned that the current reference produced not enough signal to really efficiently cancel out the QRM. I had no other antenna within reach other than the 6 m dipole with horizontal polarization, which sits just below the vertical antenna. I presumed I needed to have the same polarization as the main antenna, but decided to give it a try with the 6 m dipole. Surprisingly, that worked quite well. It produced enough signal so the main antenna signal did not need to be attenuated. The reference antenna signal still needed amplification, but less than the wire antenna in the shack. Next step is to improve the reference antenna, because I still believe giving it vertical polarization, will allow me to cancel out more nasty QRM. This entry was posted in Interference, Transceiver by Jean-Paul Suijs - PA9X. Bookmark the permalink.